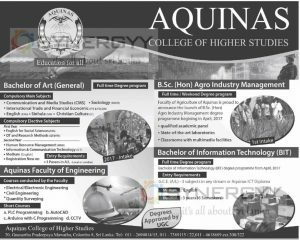 Aquinas College of Higher Studies invites applications for the range of degree programmes. All the degree programmes are UGC approved. See below for more details. It’s a full time degree programme with 2 year. Faculty of Agriculture of Aquinas is proud to announce the launch of B.Sc. (Hon) Agro Industry Management degree i programme beginning in April, 2017. This degree programme is arrange for Full time / Weekend Degree program. Aquinas invites applications for the Bachelor of Information Technolofy degree programme for 3 year with 6 semesters.